He who has Understanding to Understand, let him Understand. Almost everyone has interpreted that what is written in the Book of Deuteronomy 18:15-19 refers to only one Prophet: a Prophet like Moses or equal to Moses. The fact that the promise that The Lord our Elohim (YHVH ELOHIM) will raise up a Prophet is written twice is an allusion to not only one Prophet, but to Two Prophets. Many believe that our Lord Jesus The Christ is the Prophet "equal to" Moses or "like Moses", but it is not so. "Do not think that I will accuse you before the Father; there is one who accuses you, Moses, on whom you have set your hope. For if you believed Moses, you would believe me; for He wrote of me. And if you do not believe his writings, how will you believe my words?" (John 5:45.46). Jesus clearly says that Moses wrote of Him, of Jesus The Christ (Deuteronomy 18:15). Jesus does not accuse "before the Father"; "who… accuses", "before the Father" is "Moses". And Jesus says that "He wrote" of Him (of Jesus The Christ, and not of Moses), (in Deuteronomy 18:15). For if it were interpreted that our Lord Jesus The Christ was also referring to Deuteronomy 18:18-19, He would be saying that He was the Prophet "equal to" or "like" Moses. However, while Jesus does not accuse "before the Father", "who... accuses" "before the Father" is "Moses". "So they said to him, Then what sign do you do, that we may see and believe you? What work do you perform? Our fathers ate the manna in the wilderness, as it is written, He gave them bread from heaven to eat. Jesus then said to them, Truly, truly, I say to you, It was not Moses who gave you the bread from heaven; but my Father gives you the true bread from heaven. For the bread of God is he who comes down from heaven and gives life to the world [Ecclesiastes VII, 12]." (John 6: 30-33). "373. Rabbi Shimon said: Many people are nourished from it today. And who are they? They are the friends, who are occupied with Torah days and nights. And if it you think that it was actually the same food THAT THE CHILDREN OF YISRAEL ATE IN THE WILDERNESS, it is not, but it is very similar to that food, for it is worth double THE MANNA THAT THE CHILDREN OF YISRAEL ATE IN THE WILDERNESS." "374. Come and behold: when Yisrael came and cleaved unto the Holy King, they merited then to eat a much higher bread because of the uncovering of the holy sign OF THE CIRCUMCISED ORGAN. Before, when they left Egypt, they came with bread called unleavened bread (Heb. Matzah), WHICH IS MALCHUT. Now they merited to eat a different, much higher bread, from a high place, as is written: "Behold I will rain bread from the heavens for you," actually from the heavens, WHICH IS ZEIR ANPIN [TIPHERETH], and it became available to Yisrael from this place at that time. The friends who are occupied with Torah are nourished from a higher place. What is it? It is as written: "Wisdom [CHOKMAH] gives life to those who have it" (Kohelet [ECCLESIASTES] 7:12), which is a place far higher THAN ZEIR ANPIN." (The Zohar). Jesus The Christ our Lord is obviously DIFFERENT from the Prophet Moses. The Prophet Moses is the Faithful Servant of our Lord Jesus The Christ and His Faithful Shepherd. In the light of this understanding, the correct interpretation of Deuteronomy 18:15-19 is to understand that it clearly speaks of Two DIFFERENT Prophets: THE TWO COMFORTERS. The Prophet of Deuteronomy 18:15 is the Prophet "equal to" YHVH ELOHIM. The Prophet of Deuteronomy 18:18-19 is the Prophet "equal to" Moses. "A prophet from among you, from your brothers, like me, ADONAI your God [The Lord your God] will set up for you, you shall hearken to him. According to all that you asked of Adonai your God [The Lord your God] in Horeb, on the day of the Assembly, saying, "Let me not continue to hear the Voice of ADONAI my God [The Lord my God], and let me no longer see this great fire, so that I will not die." And ADONAI [The Lord] said to me, "They have done well in what they have spoken, I will set up a prophet for them from among their brothers like YOU; and I will put My words into his mouth, and he will speak to them all that I command him. And it will be that whoever does not hearken to My Words -that he speaks in My name- I will exact it of him." (Deuteronomy, 18:15-19). "A prophet from among you, from your brothers, like me, ADONAI your God [The Lord your God] will set up for you, you shall hearken to him." "YHVH your God will raise up for you a Prophet like Me from among you, from your brothers, you shall listen to him..." (Deuteronomy 18:15). "A Prophet from among you, from your brothers, like me, ADONAY your God [the Lord your God] will set up for you, you shall hearken to Him." (Deuteronomy 18:15, "Torah"). 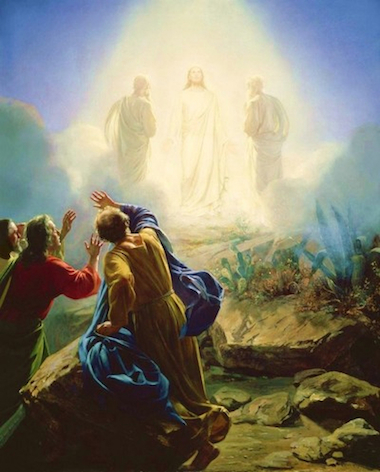 "AND AFTER six days, Jesus took with him Peter and James and John his brother, and led them up on a high mountain apart: And he was transfigured before them; and his face shone like the sun, and his garments became as white as light. And behold, there appeared to them Moses and Elijah, talking with Him. And Peter answered and said to Jesus, Lord, it is good for us to be here: if you wish, we will make three booths here: one for you, and one for Moses, and one for Elijah. He was still speaking when, behold, a bright cloud overshadowed them; and behold, a voice from the cloud said, This is my beloved Son, with whom I am well pleased: listen to him." (Matthew 17: 1-5). "And a cloud overshadowed them, and a voice came out of the cloud, saying, This is my beloved Son: listen to him." (Mark 9: 7). The Lord our God, the Holy One, Blessed Be He, Announces to His Servant Moses that He, the Lord our God, will Raise up A Prophet "LIKE" HIM, Like The Lord Our God... And He Commands: "... you shall listen to HIM...", "... you shall hearken to Him..."
"This is My Beloved Son: listen to Him...", "… you shall listen to Him", "... you shall hearken to Him...", (Deuteronomy 18:15). "... listen to Him..." (Matthew 17:15; Mark 9:7). The first promise of the Prophet of Deuteronomy 18:15 which says, "you shall listen to Him...", "you shall hearken to Him...", is confirmed by the (Father's) Voice from the Cloud (of the Shekinah) that in the Transfiguration says to Moses, Elijah, Peter, James and John about our Lord Jesus The Christ: "... listen to Him...". The coming of the Prophet "like" God of Deuteronomy 18:15 has already occurred with our Lord Jesus The Christ, the Son of Man and the Heavenly Father's Only Begotten Son. The coming of the Prophet "Like" Moses of Deuteronomy 18:18-19, the "other Comforter", "the Father's Holy Spirit" is for these "final days". "A Prophet from among YOU, from YOUR brothers, like me, YHVH your God will set up for you, you shall hearken to him..."
But if we understand that He who says: "Prophet among YOU" is not Moses who is speaking of himself using "YOU", but it is God who speaks through Moses' Mouth (*), the Prophet here is the Prophet "like" God. (*) "I will be with thy mouth, and teach thee what thou shalt say..." (Exodus 4: 12). "... the seed of the woman [Gen. 3:15] & the Prophet [Deut. 18:15] & the Shiloh [Gen. 49:10; Deut. 18:18-19] spoken of by Moses..." (Isaac Newton, "Our religion to Iesus Christ"). In Deuteronomy 18:15 it is God Who speaks through Moses' Mouth, and (God) says: "Prophet ... like [or "equal to"] Me...". In Deuteronomy 18:18 it is God Who SPEAKS to Moses, saying to him: "Prophet ... like [or "equal to"] you...". When John the Baptist was asked whether he was "Elijah" or "the Prophet" (of Deuteronomy 18:15), he replied saying: "No...". "And if you are willing to accept it, He [John the Baptist] is the Elijah who was to come." (The Holy Gospel According to St. Matthew 11:14). The Prophet Elijah was indeed incarnated in John the Baptist. But what spoke in John the Baptist when he was asked whether he was the Prophet Elijah was another Soul called "the Little Iao" which along with Prophet Elijah's Soul were reincarnated in him. "Of the incarnation of John the Baptist." "Now it happened that when I came into the midst of the archons of the Aeons, I looked down at the world of mankind, at the command of the First Mystery. I found Elisabeth, the mother of John the Baptist, before she had conceived him, and I cast into her the power which I had received from the little IAO, the Good, who is in the midst, He who has the power to preach before me and to prepare the way, and to baptise with water of forgiveness of sins. That power is then in the body of John." "Moreover, in the region of the soul of the archons which he was due to receive, I found the soul of Elias in the Aeons of the sphere and I remove it from there and receiving his soul again, I brought it to the Virgin of light, and she gave it to her receivers; they brought it to the sphere of the archons and they cast it into the womb of Elisabeth. Wherefore the power of the little IAO, he of the midst, and the soul of the Prophet Elias were bound in the body of John the Baptist. For this cause you doubted at the time when I said to you "John said, I am not the Christ", and you said to me, "It is written that When the Christ shall come, there will come Elias before Him, and he will prepare his way". But when you said this to me, I replied to you, "Elias has indeed come, and he has prepared all things, as it is written, and they did to Him as they pleased". And when I knew that you did not understand what I said to you concerning the soul of Elias which is bound in John the Baptist, I answered you openly and face to face, saying: "If it pleases you to accept John the Baptist, He is Elias of whom I have said that he will come"..." ("Pistis Sophia"). The "Little IAO" within each of us is one of the Parts of the Being. "As it is written in Isaiah the prophet: Behold, I send my messenger [Angel] before your face, Who shall prepare your way. The voice of one crying in the wilderness: Prepare the way of the Lord, Make his paths straight. John baptised in the wilderness and preached a baptism of repentance for the forgiveness of sins." (Mark 1: 2,4). "Then [the pharisees] said to him [to John the Baptist], Who are you, so that we may give an answer to those who sent us? What do you say about yourself? He said, I am the voice of one crying in the wilderness: Make straight the way of the Lord, as the prophet Isaiah said. Now they had been sent from the Pharisees. They asked him, and said to him, Then why are you baptising, if you are neither the Christ, nor Elijah, nor the prophet? John answered them saying: I baptise with water; but among you stands one whom you do not know. He is the one who comes after me: the thong of whose sandal I am not worthy to untie. These things took place in Bethany beyond the Jordan, where John was baptising." (John 1:22-28). When John the Baptist replied that he was not "Elijah" nor "the Prophet", it was the part of the "Lesser Iao" reincarnated in him that was answering, and not the Soul of the Prophet Elijah who also was simultaneously incarnated in him along with the portion of the "Little Iao". "I have seventy names, corresponding to the seventy tongues of the world, and all of them are based upon the Name of my King, the Holy One, Blessed be He, but my King calls me 'youth'... [...] the Holy One, Blessed Be He,... called me the 'Little Iao' in the presence of his whole household in the height, as it is written: 'For My Name is in him'...". (Exodus 23, 21). ("Hebrew Book of Enoch", 12. 1, 5). "... in the Zohar hakadosh in the Raayah Mihemnah (Pinchas 219a): The neshamah of Moshe Rabeinu is told that only he is permitted to employ Matatron Sar HaPanim; for his name is alluded to by your name." 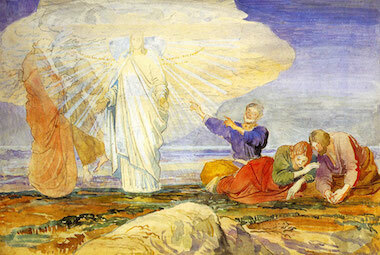 It was the Voice of the Prophet Moses, "the voice of one crying in the wilderness" and who prepares "the way of the Lord", who Baptises with Water, the Angel of the Face of the Lord, Enoch-Metatron, the Little Iao who, reincarnated in John the Baptist, said that he was not the Prophet Elijah and "the Prophet" either. Obviously, John the Baptist did not say that he was not the Prophet "like" Moses of Deuteronomy 18:18-19, but that he was not "the Prophet" of Deuteronomy 18:15, the Prophet "like" God. John the Baptist confirmed that He was indeed "the voice of one crying in the wilderness", who makes straight "the way of the Lord, as the prophet Isaiah said". And he who baptises "with water...", as our Lord Jesus The Christ says in the "Pistis Sophia" that John the Baptist is "… the little IAO, the Good, who is in the midst, He who has the power to preach before me and to prepare the way, and to baptise with water of forgiveness of sins. That power is then in the body of John...", the power of the Prophet of Deuteronomy 18:18-19, the Prophet like Moses. "10 And there has not arisen a prophet since in Israel like Moses, whom YHVH knew face to face;..." (Deuteronomy 34:10). "... Moses, the faithful prophet, the greatest of all the prophets..." (The Zohar). And likewise, it is written of John the Baptist that "there is not a greater prophet than John the Baptist..." (Luke 7:28). "24 When the messengers of John had left, he began to speak to the crowds concerning John, What did you go out into the wilderness to behold? A reed shaken by the wind? 25 But, what did you go out to see? A man clothed in soft clothing? Behold, those who are gorgeously appareled and live in luxury are in kings' courts. 26 But What did you go out to see? A prophet? Yes, I tell you, and more than a prophet. 27 This is he of whom it is written, Behold, I send my messenger before your face, Who will prepare your way before you. 28 I tell you, among those born of women there is not a greater prophet than John the Baptist: yet he who is least in the kingdom of God is greater than He." (The Holy Gospel According to St. Luke 7:24-28). "... It is to be noticed that this Holy Land -the Shekinah- is called 'the land of Israel'..." [...] "The term 'holy land' refers to the Shekinah,..." (The Zohar). A True Israelite is the person who incarnates and realises Tifereth. A True Jew is the person who incarnates and realises Chokmah.